Our web hosting packages offer AWStats, a dashboard that displays traffic to websites on your hosting platform. Note: AWStats tracks all traffic to your hosting platorm. 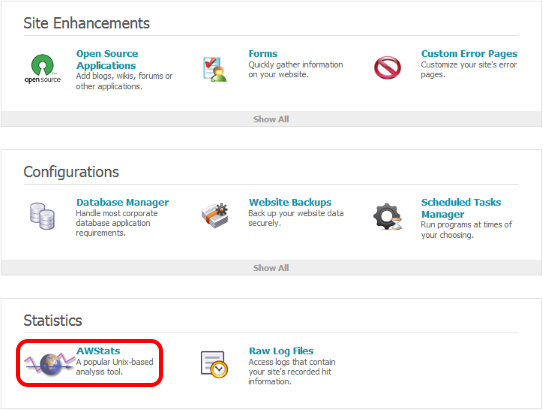 If you host multiple sites on one account, AWStats does not provide reporting on a site-by-site basis, the reporting is cumulative. You may wish to use a third-party tracking software such as Google Analytics, which is free, and involves adding a small amount of code to your website. For more information on using Google Analtyics, including step-by-step guides on incorporating it within WordPress, please see the articles in the Related Articles section. 1. Click here to log into your account. 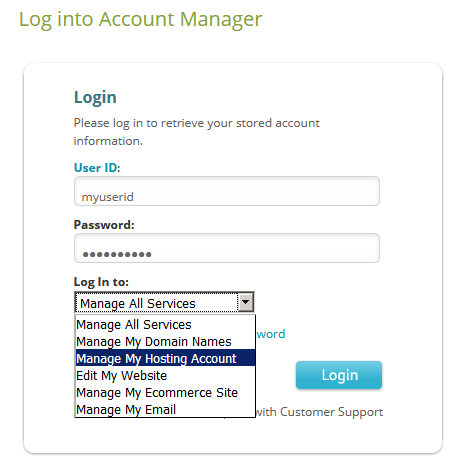 From the drop-down menu, select Manage My Hosting Account. 2. If you are already logged in, then click My Hosting Packages. 4. Scroll down to the Statistics section, and then click the AWStats option. 5. Click the Enable button. The first AWStats report will typically be available within 24 hours. After 24 hours, return to this same section to launch your AWStats. You must log in with the User ID and Password shown on this page, not your Network Solutions account login details. 6. Click either link— Show or Hide to show or mask the password. The password is masked or hidden. Note: AWStats usually updates daily by 3 PM Eastern, not weekly as displayed. You can begin using AWStats to track the visitor traffic that comes to your website.